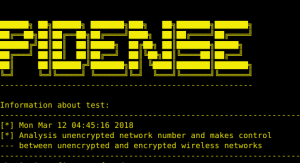 Browse: Home / pidense is a tool for Monitoring illegal wireless network activities. pidense is a tool for Monitoring illegal wireless network activities. + Watches SSID broadcasts at the blacklist. + Collects all the packets from Wireless Networks. + Analyzes all the beacon packets. + Logs the activity with some extra information within defined template. ← malscan – A Simple PE File Heuristics Scanner.